Last month I was invited along to the ExchangeWire studios to take part in their latest MadTech Podcast as the weeks special guest. I joined ExchangeWire’s CEO, Ciaran O’Kane, and COO, Rachel Smith to chat about Unruly, programmatic, and the latest trends and news stories from the world of advertising. Now that Brian O’Kelley is moving on, what does he do next? What can be done to save Johnston Press? And what can ad tech do to help journalism? Has OTT hit a saturation point, and does ad-funded content still have a future? The Unruly solution for buyers and sellers. The shift from IO to programmatic guaranteed, and what that means for the market. The future of independent ad tech, and the differentiation required to survive. The IAB’s newest London event takes place next week. The Nonference (1 November, Tobacco Dock) is designed to be an interactive conference about the digital world, featuring a mix of famous names and emerging talent from across the industry. Presenting ‘The art, science and superpower of emotions’, Unruly’s resident emotional insight boffin Rebecca Waring, VP Insight, will chair a panel that explores the different ways emotional data can be captured, choreographed and decoded. Partnering with our friends over at Visualogical (artists Victoria Westerman and Natasha Gertler), this session will be unmissable for anyone interested in understanding emotions and how they can be harnessed. Visualogical is an interactive digital workshop that premiered at London Art Night in July, which harnesses the power of group collaboration and artificial intelligence to create collective art. Using word association, archetypal symbolism and colour psychology, Visualogical allows you to illustrate your mind, giving you the unique opportunity to walk away with your very own psyche self-portrait (pictured). Rebecca will share a sneak preview of Unruly’s latest research about how emotions can drive brand building and customer actions, as well as show how Unruly’s emotional testing and targeting can deliver fantastic results for advertisers. The Nonference takes place on 1 November at Tobacco Dock, London. Visit the IAB for more information. One of the things we care about at Unruly is encouraging diversity across the business. Recently, inspiring Unrulies Sarah Young and Hannah Mackaness were approached by Sky and asked to do an interview on what it’s like to work somewhere where diversity and inclusivity are celebrated. The pair loved the conversation that spurred from the interview, and asked if they could re-film it so that it could be made available for anyone to watch. During the video the pair speak about the ProDev teams approach to diversity and inclusivity. They also speak about the changes they put in place that allowed the team to double the amount of women working in it. The pair also talk about the journeys that brought them both into ProDev, and the impact that support for inter-team transitions has had on the team as a whole. Does Unruly sound like somewhere you’d like to work? You’re in luck! We are hiring for new positions across the world! Take a look at which roles are currently available. On 6 November we kick off our next Trust Talks event in London. On a scale of 1-10, how excited are we to bring this event back to the UK? We reckon about 15! This edition of Trust Talks is focused on all things programmatic! The programmatic advertising ecosystem can be a confusing place – so full of acronyms, vendors and platforms that it can be hard to know who (and what) you can trust. The issues of brand safety have dominated the headlines in recent times, and this is only becoming more of a concern as programmatic buying continues to scale. In light of this we decided it was time to bring influential figures within the programmatic sphere in the UK together under one roof for the morning to discuss the problems and opportunities that programmatic is facing, and how we can work together as an industry to either solve or embrace them. We will be hosting a number of panels throughout the morning to discuss and tackle some of the most prevalent issues and questions being asked across the programmatic model. Take a look below to find out who will be speaking, and what each panel will cover. Trust Talks: The Great Programmatic Debate will be live streaming via the Unruly Facebook page from 9-12 on Tuesday 5th November! Moderated by Ronan Shields, Ad Tech Reporter, Adweek. This panel will address the issues and opportunities facing premium publishers in 2018. From the rise of initiatives such as ITP from Safari restricting ad opportunities on mWeb, right through to the complex landscape of unified yield management, also known as header bidding. The panel will discuss life post-GDPR, the rise of 2nd party data marketplaces, and why publisher coalitions are so hot right now. Moderated by Paul Gubbins, Programmatic Lead, Unruly. This panel looks at where we are as an industry in the quest for an alternative and open ID. They will challenge the idea that life post-cookie will challenge visibility for both buyers and sellers, unless they operate within walled gardens. The panel will also explore ID portability, and how initiatives from bodies such as the IAB Tech Lab will tackle areas of concern such as digital ID management, privacy legislation and the explosive growth of connected devices. Moderated by Vincent Flood, Editor, Video Ad News. This panel will discuss in detail the ever-changing programmatic landscape and look at best practice examples from those on the buy side. it will address topics such as auction mechanics like bid caching and shading, releases such as ITP from Safari, and the emergence of new transaction models such as programmatic guaranteed. This panel will also discuss preferences for 1st versus 2nd price auctions, and how initiatives such as ads.txt have changed the way traders buy. Moderated by James Chandler – CMO, IAB. This panel will focus on how marketers are showing an increasing appetite to understand the connection between consumer emotions and digital advertising. Post-GDPR, and pre full roll out of the CCPA, dependencies on 3rd party data sets have been wound down. Marketers and agencies are now looking for signals familiar from traditional advertising buys, but that are often overlooked in programmatic. Featuring pioneering insight from UnrulyEQ, this panel will discuss the rise of AI and what using traditional targeting methods via modern programmatic technology actually means for those on both the buy and sell sides. In the past a sudden fall in the temperature, a flutter of snow, or the sound of jingle bells would indicate that Christmas was on it’s way. These days it’s marked by the Christmas ads that begin to appear around the beginning of November. Our UnrulyEQ team have been hard at work trying to decipher which emotions make Christmas ads so moving and memorable. If you think back to Christmas ads gone by I’m sure a whole host of images and emotions pop into your head, from the Coca Cola truck and a man in the moon, to a clumsy cat and a dancing carrot. The team have looked at some of the most popular festive ads from the past three years to find out what emotions they evoked, and what issues they sought to address. Overall, from our analysis of ads from 2015, 2016 and 2017, we can see that Christmas ads have a clear trend of evoking strong happiness and warmth, followed by inspiration and nostalgia. It’s no surprise that companies have decided to evoke these emotions from their ads, as for most, of us they come hand in hand with this time of year! We experience feelings of happiness and warmth when thinking about spending time with loved ones. We also experience nostalgia when we think back to what makes Christmas special to us. Normally this is a something we do every year like watching our favourite festive film, coming together to cook a Christmas meal, or playing that board game that only materialises on Christmas day and then disappears for the rest of the year! The emotional profile of 2015 falls neatly in line with this trend that Christmas ads follow, evoking strong emotions of happiness and warmth, followed by good inspiration, nostalgia, amazement, pride and sadness. This was the year of John Lewis’ famous ‘Man On The Moon’ ad, and the year that Sainsburys brought the children’s book character Mog the cat to life. The following year saw the strongest emotional response, outperforming across the main Christmas related emotions. This year also saw ads evoke stronger feelings of pride, sadness and hilarity than other years. Think John Lewis’ ‘Buster The Boxer’, M&S’s Mrs Claus, and Heathrow Airport’s ‘Coming Home’ ads. Last year had a similar emotional profile to 2015, although evoked slightly lower sadness and inspiration but higher hilarity. This year saw McDonald’s launch their ‘Carrot Stick’ campaign, and BBC One created an animated ad bringing a girl and her father together over a Christmas performance. The common thread running through these three ads is that of familiarity. All of them offer a concept that is familiar to the viewers which results in a low likelihood for confusion and allows for an amplified emotional effect amongst viewers. Another noticeable theme across these top Christmas ads is that of togetherness and inclusion. All three ads managed to capture the spirit of Christmas in different ways. ‘Man On The Moon’ focused on loneliness around Christmas and the importance of making everyone feel like they matter, regardless of age. ‘Buster The Boxer’ offers a stronger focus on inclusion, which is a common interest which can unite even the most natural enemies. ‘Supporting Act’ showcases the act of being present for one another when it really matters. Both ‘Man On The Moon’ and ‘Supporting Act’ shed light on important topics of today and put a new spin on the traditional Christmas theme of happiness and warmth. On the other hand, ‘Buster The Boxer’ played on the genuine and childlike happiness that Christmas evokes in many of us, while adding a humorous twist. Looking at the top ads from 2015, 2016 and 2017, warmth and happiness were the top two emotions that were evoked. However we were surprised to find that the third strongest emotion was different for each ad. In EDEKA’s ‘Heimkommen’ ad there was a strong focus on loneliness which evoked considerable sadness amongst viewers. The ad saw a strong emotional response with some polarising views due to the portrayal of loneliness showing the faking his death to bring his relatives together. John Lewis’ ‘Buster The Boxer’ ad evoked considerable amazement, this was likely due to the highly relatable concept of the simple joy of a trampoline. Viewers were likely further amazed by how well the ad captured the genuine happiness expressed by not only the dog but all the animals playing on the trampoline. This original concept resulted in viewers being surprised by the ad, which likely fuelled the noticeable amazement. During Barbour’s ‘Snowman’ ad viewers felt highly nostalgic. This was likely due to basing the ad on the famous animation from the 1980s and its sequel from 2012; this allowed for capturing a wider audience that would relate with the concept. The ad further offered a strong nostalgic link due to using the same style of animation as the story it is building on. To download the full Christmas Insights slide deck head here. Find out how UnrulyEQ can help improve the success of your ads by understanding the emotional, behavioural and cultural characteristics that supercharge your campaign. The programmatic advertising ecosystem can be a confusing place – so full of acronyms, vendors and platforms that it can be hard to know who (and what) you can trust. The issues of brand safety has been publicized for quite some time, and is only becoming more of a concern as programmatic buying continues to scale. 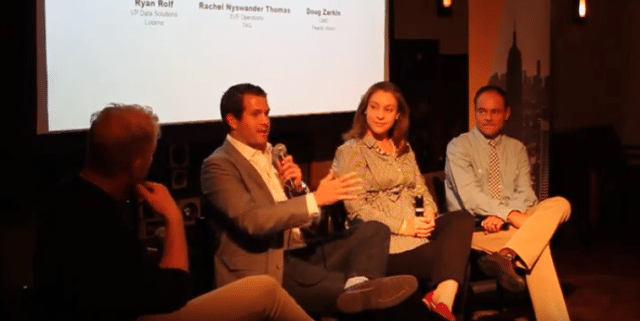 At our last Unruly Trust Talks event in New York, Unruly’s Programmatic lead Paul Gubbins sat down with Ryan Rolf, VP Data Solutions at Lotame, Rachel Nyswander Thomas, SVP Operations at TAG, and Doug Zarkin, CMO at Pearle Vision to uncover the truth behind popular programmatic myths, and how advertisers can work to rebuild trust. Paul Gubbins (PG): Why do publishers and brands still not trust adtech vendors? Doug Zarkin (DZ): It’s because people blindly trust technology in this space. The programmatic model is only as good as the input you put in it. One of the main flaws in the programmatic model today is that there isn’t enough of an understanding of brand intent or consumer targeting. It’s just the programmatic model says, for example, I should target blonde, blue-eyed women between the ages of 27-35 who have a poodle. There’s not enough of an understanding of the person that’s pulling those levers and making those adjustments to the programmatic model of what the brands intent is, and what reality looks like outside of the algorithm. Rachel Nyswander Thomas (RT): I think you’re spot on, I also think there are other aspects to it. I understand brands saying they need to know everything that is happening in the programmatic model, and that is part of what TAG works on – the transparency of exactly what is going on in the supply chain. We are exactly three years old, which isn’t very long in the history of programmatic in terms of having standards by which you can judge the efficacy of your anti-fraud vendors. Yes, there are the MIC guidelines, but let’s be honest, there’s a lot more to fighting fraud than that. I think we are gaining trust back as an industry at this point. Knowing your partner’s more closely is going to be key to continuing to do that. PG: As I think we all agree programmatic is good, but nowhere near as good as it could be, how do we fix this? DZ: Firstly I think there are some opportunities with the agency model: we need to look at what should be done in-house and out-of-house. Secondly we need to look at the ad experience. Let’s not forget the advantage of advertising is to motivate an action, and that action comes in two ways. There has to be an emotional decision before that rational choice. One of the questions we need to ask is how do you make the advertising experience better in the digital landscape? The answer is deliver a better brief. We have an amazing creative agency that does all our digital stuff and contrary to their earlier view, they love doing digital because they’re not confined to a 30, 60 or 15 second ad. We can create a 72, 83, or even a 2:12 second ad if we want to tell the entire story. The input that goes into any model, especially when it comes to programmatic, is only as good as the amount of time you’ve taken to write the brief. You also need to understand the emotional decision making process a consumer goes through before they make that rational choice to click on your banner and take the action. The entity itself has to be done right before the results can come. Programmatic is simply the science. The art really comes in the ‘what’. If you are a brand in a competitive market you really need to ask yourself what your ad is saying, and communicate that in an emotive way to your consumers. Everyone says that Amazon is killing retail. They aren’t, they are just killing bad retail. The bar has been raised for all of us who are in a position to drive the ‘what’, to spend more time thinking about what the ‘what’ is, before we spend too much time thinking about ‘how’. PG: There are now a multitude of different vendors you can work with within the advertising space. There’s no shortage of buy side vendors, of sell side vendors or of third party data vendors. How do you go about navigating that space and finding the right vendors that you can trust? Ryan Rolf (RR): As an independent company we come up against the clouds, your Adobe, your Neilsons and this goes back to that whole idea of saying that no one ever got fired for choosing blue, and this is something we come up against all the time. The issue we have is that people don’t know us as well as they do the bigger vendors. Our main message is the fact that we really just specialise in data, and help companies untap that data, which to Doug’s point is just one piece of the puzzle. People often come to us if they are looking for that, rather than the cloud companies who have 50 other solutions that they are trying to sell them that they just don’t need. DZ: I think brands have to come down and data suppliers and providers need to come up and be able to keep things as simple as possible. Because at the end of the day I don’t believe there is a comprehensive understanding that exists. All the problems about what websites to go to and privacy this and privacy that, those are all real issues and I’m not mitigating the impact of them, but I do not believe that the technology in those who are empowered with only the technology realise that any buyer of that technology isn’t a tech nerd. PG: Why as an industry do you think we keep over-complicating things? RR: I think truthfully the only reason we over-complicate things is because we keep trying to tell the story smarter than the next guy. DZ: There’s an enormous disconnect between data and knowledge. None of us suffer from a lack of data, we live in an era of big data. We have to remember that data is only as useful as the questions you ask. Data does not make decisions. People make decisions using data, and so I think when you’re looking at vendors, whether they be big or small, you need to really look at their ability in doing that. PG: Aare companies asking TAG the right questions around trust and transparency? Should there be a template issued by the IAB to help both buy and sell side vendors ask everybody the right information to track those insights? RT: The conversation has to be very unique between partners. Everyone knows we certify organisations but a big part of what we focus on is not just are you certified or not, it’s connecting the dots between partners and encouraging them to get to know each other better beyond just seeing whether a company is certified or not. At the moment within this industry brand safety means something different to everyone. We need to dig further into what the advertiser actually wants and what does the publisher actually have to offer, that transparency and connection is vital, a checklist can only go so far. Unruly has announced a new partnership with VICE Media that will name the adtech company as the supplier of the 100% viewable video ad format known as UNmissable across the publisher’s German language sites. A recent representative research from Unruly, in cooperation with NORDAKADEMIE, about user journeys, shows where online video ads have the most impact on consumers’ behaviour and which video length works best for which sales funnel stage. The empirical survey was based on a sample of more of 1,000 people from the UK, Germany, APAC and the US. The results demonstrate that especially customers with an affinity for brands prefer online video advertising to support their final purchase decision. This is exactly where Unruly’s recently released UNmissable video ad takes place: at the very end of the funnel, where it just needs a very short video length to trigger the final stage “Intent to purchase”. The UNmissable format is designed to be fully viewable with 100% of the ad’s pixels in view for the duration of the video. Compatible on both mobile and desktop, the format helps advertisers reach and engage their audiences across Unruly’s trusted premium network in an effective and engaging manner. The format fully complies with the Coalition of Better Ads and scores well against the IAB’s LEAN​framework. Through the partnership with VICE Media, the UNmissable format can be delivered on VICE and its verticals and blogs like Dressed like Machines, Schlecky Silberstein and notesofberlin, managed as well as programmatically in a brand-safe manner via PMP through Unruly’s data-powered video marketplace, UnrulyX. A GroupM / Newsworks study, published in July 2018, shows that the delivery of campaigns in premium environments is 42 percent more cost-efficient for advertisers. Average uplifts of +10.5 percent for brand awareness, +19.2 percent for ad recall, +9.7 percent for brand perception and +10.3 percent for recommendation intent are achieved. “We are very proud to welcome VICE as the latest member of the Unruly family of premium media brands. We understand the challenges publishers and advertisers are facing when it comes to addressing the different sales funnel stages, which led to the invention of groundbreaking formats such as UNmissable. Today, big budgets go into the short video length Youtube bumper ads, as well as into Facebook, where autostart and sound off is well accepted for this purpose”, says Christoph Thielecke, Managing Director, Unruly Germany. Unruly also uses its Header Bidding solution optionally for publisher collaborations to provide the best user experience while maximizing revenue potential. Our APAC team has scooped the Best Ad Ops Team Award at The Drum Digital Trading Awards APAC! The Ops team have gone above and beyond this year by growing programmatic expertise within their team, bringing in experts, and up-skilling staff from across the business. As a result they’ve been able to provide industry-leading client service within the region. As well as providing custom data solutions and outstanding insights and support. The team had a great time celebrating the win at The Drum Digital Trading Awards ceremony. Well done everyone, hope you had an amazing night! Next up in our ‘Inside ProDev’ series we sat down with one of our Product Managers Julien Altoé to find out what it’s like to work as a Product Manager in the ProDev team. Q: Hi Julien, first of all, could you introduce yourself and tell a bit about what you do here at Unruly? As you faultlessly said, my name is Julien, and I am a 28-year-old Frenchman that has been working at Unruly for three years. After a few roles in the Ops team, I am now a Product Manager in the ProDev team. I am the home Product Manager for the Demand Side, and as the name implies, we are the team that look after the demand side of the business. Making sure anyone willing to access the video supply we’re offering can do it seamlessly. Q: Can you talk a bit about how you joined Unruly? As I have met numerous ad tech companies in my previous role, it was only a matter of time before Unruly crossed my path. With Sandra, the commercial in charge of OMD, we skipped the usual formal meeting in the lobby and went straight for lunch. We had an instant connection and after she told me about the Unruly culture, she mentioned an offer as a Campaign Manager in the French office they were currently looking to backfill. I applied the following day. Having the opportunity to work abroad regularly was my main incentive, and three years later, I am more than happy about the outcome! I started in Paris, went to Sydney for a few months, spent some time in Hamburg. I have also collaborated with our New York, Singapore and Stockholm offices, and am now based in London, love it! Q: What notable roles did you hold before? I had a variety of jobs when I was studying sports marketing. I’ve been a seller at IKEA, a warehouse worker at Chronopost, a receptionist in a bank and even a binman! I believe each role helped me to be versatile and adapt to my following experiences. Once I completed my Masters, I had no experience or knowledge in digital advertising. However, I was fortunate enough to get an internship at OMD as a Digital Media buyer. After six months I got a role as a Digital Trader, which is where I started playing with programmatic. After that I took on the role at Unruly as a Campaign Manager in Paris, and completed my tour in Australia. I then started as a Senior Campaign Manager when I moved to London. We launched our programmatic offering, and I helped build the tools and processes needed to develop the new business model. I moved on as a Programmatic Ops in the UK and continued to support the team with the daily activities, as well as longer-term projects around programmatic. Q: How would you explain your job to your grandparents? I’ve been trying for a while now, but I’m not sure I’ve found the right way. I tell them that it’s similar to the massive poster ads you see at the bus station, but I do it on web pages! It’s difficult to explain to your grandparents, especially when it comes to the scary and complicated internet! As a Product Manager, I try to explain to them what that means on a daily basis. I tell them that we build things, and I have to make sure we build the right things, in the right way. Q: What draws you to this type of work? I believe this is very much related to my personal development. If you asked me three years ago, I would’ve never imagined I’d be a Product Manager in an adtech company in London. Talking in front of an audience was the scariest thing for me, but now I do it every day. At the beginning my knowledge of technologies was more than limited. Along the way I’ve been lucky enough to find patient mentors who shared their adtech masteries throughout the years, and helped me progress within the company. I’m honestly not too sure how I ended up here. I took my chances when opportunities arose, which is very much interrelated to my development as a (grown-up) man. I continuously try to stay open-minded and adapt my approaches to new situations. Empathy is a keyword in the team. Being surrounded by people who care is indispensable for me. I am fully aware that we’re in a business with commercial goals, however, that doesn’t mean we have to remove the human aspect from the equation. Q: What continues to surprise you about your work? During the hiring process at Unruly everyone is given 30 seconds to “Deliver Wow”. I wanted to show something about myself that I wouldn’t usually do with people I just met. I told the team about my sense of humour and that I would do things that only I would find funny. They were fine with that as Unruly is a place where you can just be yourself. Every day I collaborate with new people, and I’m still amazed to see how diverse and tolerant people are in this company. Arriving in the ProDev team after almost three years in the Ops team was full of surprises! I’ve discovered a new way of approaching my work with lots of retrospective and feedback sessions, where we are as transparent as possible and try to learn from previous iterations. That continuous quest for improvement, both in terms of productivity and well-being, is a real enjoyment for me! Q: It’s the weekend: what do you like to do in your spare time. I am fortunate enough to have a garden, and I spend lots of time there. I do feel some enjoyment from not taking the tube anymore and cycling around as well, I’ve discovered so many new places and areas since I got my bike. Also, I’ve been practising Crossfit for more than a year now which I love. It is super important to help me maintain a positive mood most days. Finally, watching the Premier League takes a significant part of my free time, as Arsenal produce good football while losing at the same time! Q: What kind of challenges does ProDev tackle? As we’ve grown up very quickly in the past few months, some new internal challenges arose within the team. One very important thing in a company with such a unique and strong culture is to make sure new joiners understand the foundations and values of the business, as well as to feel a part of it as early as possible. In an always changing environment where new priorities and market needs can disrupt the short and long-term objectives quite regularly, some external challenges have to be faced by developers. Q: What music do you listen to while working/do you have a specific playlist? I most definitely do have a few playlists, their vibes vary a lot, depending on the weather, the day of the week or even the football results! I enjoy different types of music from reggae/dub to techno, rap, house and even some French classics for nostalgia. There’s my “Principalement du Chill” playlist that I listen to a lot, and my “D’ici et d’ailleurs, enfin surtout d’ailleurs” playlist that can cure a punctual blues! Want to join the Unruly family? You’re in luck, we’re hiring! Check out our job page for the latest roles! Meet some other members of the ProDev team! Paul Gubbins, Unruly’s Programmatic Lead has made it into The Drum Digerati – an annual celebration of 100 outstanding individuals excelling in the UK digital industry. The Drum’s Digerati showcases success and ingenuity from some of the most pioneering digital marketers working in the UK today. Based on nominations from The Drum readers and curated by their editorial team, the list celebrates talent from four categories: agencies, brands, adtech & martech and media & platforms. Paul Gubbins has over 16 years’ experience in the advertising sector, with the last nine spent in programmatic. Shortlisted by The Drum in 2017 as one of the most influential people in the digital advertising sector, Gubbins sits on the Captify advisory board, is a mentor at The Programmatic Advisory and is regularly asked to moderate or participate on panels about how automation is changing and disrupting the advertising ecosystem. Paul writes for The Drum as a programmatic columnist, discussing all things M&A, data & technology in the digital ad sector. Gubbins’ infectious passion and enthusiasm for all things adtech also saw him nominated by Exchange Wire in the adtech personality of the year awards. Check out The Drum’s Digerati announcement.